A clogged orifice will halt the operation of your gas water heater or other appliance that uses a pilot light to create heat. Cleaning the glass tube to the appliance can keep it in good working order before it becomes a problem. If the orifice is gunky with grime, a quick cleaning can give new life to a nonworking appliance. If the pilot light is covered in carbon residue or soot, it needs a good cleaning in order to get the appliance to roar back to life. The thin glass tube plays an important part in the running of the water heater, fireplace or other home appliance. The pilot tube supplies a small amount of gas directly to the pilot orifice. This is what creates the tiny flame that is responsible for heating the tip of the thermocouple. When the orifice is clogged, the flame won't light and burn, and this is needed to make the thermocouple tell the gas supply valve to stay open and supply gas to the appliance. Shut off the gas supply to the appliance before you begin working on the item. The shut-off valve on the gas line should be marked or colored red and should be relatively easy to find. Turn it clockwise to halt the flow of gas to the water heater. Loosen any nuts that hold the tube or orifice together or attaches it to the appliance. Pliers can work well in small or narrow areas. With an adjustable wrench, gently remove the thermocouple and the pilot tube from the gas supply valve. Be sure to not use a wrench that is too big for the job or area. This can cause the tube to break or bend lines that are in the narrow area around the water heater. Once the pilot tube is removed from the orifice, use a fine-grit sandpaper to clean off the tip of the orifice. This can remove any oxidation buildup or mineral deposits that have found their way to the crevices of the gas pilot orifice. A water heater cleaning brush is built to get into the tiny nooks and crannies of the area without damaging anything sensitive. The stiff wire brush can remove any clogs when it is pushed up and into the narrow pilot opening. A can of compressed air is good to have on hand to clean out dust and debris that the water heater cleaning brush may have dislodged. A few blasts of the compressed air will ensure a clean surface for reattaching the pilot tube. Return the pilot tube gently to the pilot orifice. 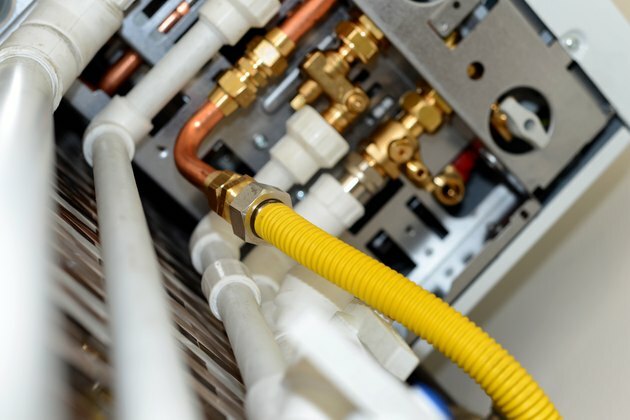 Reattach the entire pilot assembly to the water heater or appliance and reconnect the tube and the thermocouple to the gas supply valve. It should be safe to turn on the gas supply at this point and relight the pilot light if needed. When replacing all of the parts, be careful not to bend or break the tiny wires or glass tubing by overtightening nuts or pushing a piece too harshly into a stubborn opening. Occasionally or at least seasonally, check the gas pilot orifice for soot or oxidation buildup. A blast of compressed air or a quick turn with a water heater cleaning brush can keep the gas pilot tube and surrounding parts clean and in good working order. It shouldn't need to be taken apart again if regular maintenance is carried out once or twice a year.